Make maggi or tea or even heat water. Buy Singer Aroma 1.8-Litre Electric Kettle (Silver/Black) at Rs 699 only on Amazon. It also has Auto Shut Off setting with Dry Boiling and Overheat Protection for Safety. Order now before the price goes up. Hurry!!! 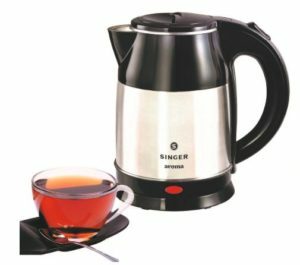 How to Buy Singer Aroma 1.8-Litre Electric Kettle (Silver/Black) at Rs 699 only?